Ferrari's much anticipated Enzo-replacement, for so-long codenamed the F150, has been unveiled in Geneva, and boasts some amazing numbers: 963bhp with its HY-KERS hybrid system, 0-186mph in 15 seconds, and a price of is charging €1,300,000 - or £1,040,000. It will go head-to-head with the McLaren P1. Ferrari has confirmed that just 499 LaFerraris will be built, but won't say what the car's maximum speed is, saying that it's an irrelevance. And in this market, it probably is - as neither this, nor the McLaren P1 will get near to Bugatti's probably unassailable advantage (267mph) in this area with the Veyron. 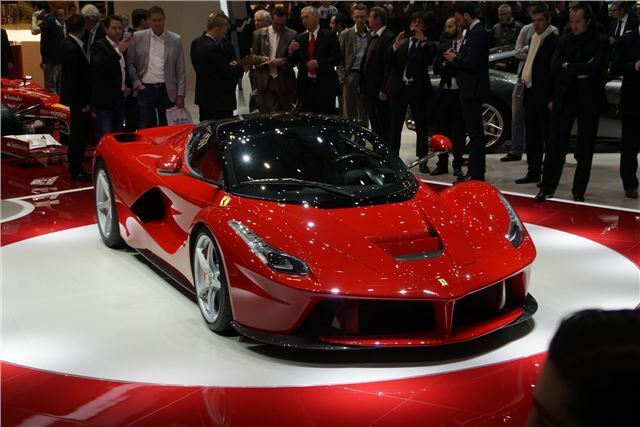 But the LaFerrari - so called because Luca di Montezemolo says 'it is the maximum expression of what defines our company – excellence' - boasts HY-KERS, a naturally-aspirated 6.3-litre V12, and Formula 1-inspired active aerodynamics. We know the headline figures already, just just as important are that the LaFerrari puts out 330g/km of CO2 - but without the full-electric drive that the McLaren P1 enjoys. The LaFerrari is underpinned by a carbonfibre tub (which uses four different types of this material), giving this mid-engined hypercar excellent weight distribution: 59:41 front-rear. The HY-KERS system is mounted within the wheelbase - as well as its V12 - all in the interests of delivering the best dynamics. There will be much talk about HY-KERS, but the 6262cc V12 is huge advantage over McLaren's Ricardo-developed 3.8-litre twin-turbo V8 used in the P1. It develops 789bhp and revs to 9250rpm - and we know that in its base form in the F12, it's a an epic engine. Combined with HY-KERS, though, that jumps to 950bhp. The hybrid system is composed of two electric motors developed in collaboration with Magneti Marelli – one powering the driven wheels and the second the ancillaries – and a battery pack attached to the floor of the chassis consisting of cells that are assembled in the Scuderia Ferrari department where the KERS for the F138 Formula 1 car is also made. Ferrari’s expertise allowed considerable savings in weight and size of the individual components and the batteries weigh just 60 kg while providing the highest energy density possible for this kind of application. Styling has been overseen by Flavio Manzoni with input from Pininfarina, and it's a clever combination of 458 Italia, F12, and a number of historic racers in the company's long history. This link with the past is an essential part of Ferrari's current appeal - and marketing - and overall, the result is very much in keeping with the market it's aimed for: so it's striking with huge presence, but not the last word in beauty. But none of this matters, as Ferrari has already confirmed that the majority of the 499 cars to be built have already found owners - and will be built over the course of two years following its on-sale date, most likely this autumn.